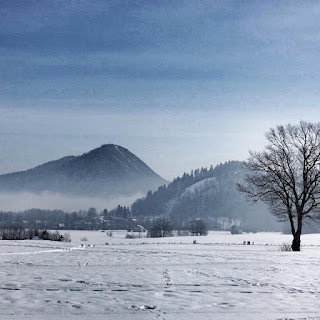 Cross country skiing in Slovenia couldn't be more idyllic, with fresh powder, tracked trails, no crowds, unbeatable mountain scenery, and quaint villages. At Pokljuka, I found fresh powder and the opportunity to learn the rigors of the biathlon -- who knew the rifle was so heavy. At Planica, a wide, tree-lined trail led up to a pristine mountain hut where I sat with the locals for a hearty lunch. Log Pod Mangart may be small but what it lacks in size it makes up for with dramatic mountain scenery. This area in the photo below, the Nordic Center Bonovec Medvode, is just 20 minutes west of downtown Ljubljana. This YouTube video slideshow offers a window into Slovenia’s cross country skiing treasures.